Fly to Oshkosh AirVenture with AirCam! AirCam’s very own Phil Lockwood will be flying our demo AirCam (outfitted with two 912 IS fuel injected engines) to Oshkosh AirVenture and we want you to join us! We will be departing Sebring, FL on July 24th with final routing to be determined in the next few weeks. If you are interested in flying with us please email Phil Lockwood () and let us know you are coming. 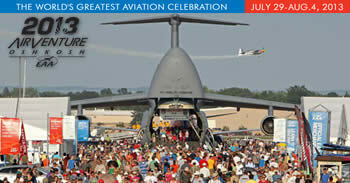 AirCam will be exhibiting at the AirVenture show in Indoor Space #2009, Building B from July 29th through August 4th.